Covers the southern part of the Malay Peninsula and is something half the size of Britain. The mountains (over 2000m) are still mostly covered by old forest. No ice has broken the lush vegetation, making the jungles of the oldest forests (130 million years) are in the world. 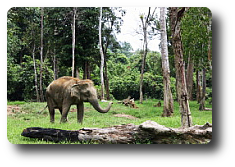 The diversity of plant and animal life in the tropical rain forests of Southeast Asia is unique in the world. 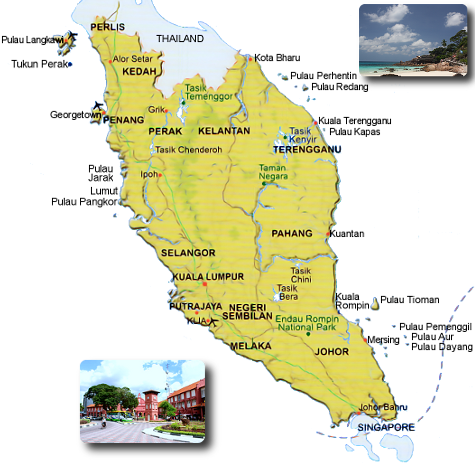 In Penisula Malaysia we have about 12 states such as Wilayah Perseketuan, Selangor, Malacca, Negeri Sembilan, Perak, Pahang, Johor, Kedah, Pulau Pinang, Perlis, Kelatan and Terengganu. Peninsular Malaysia offers the visitor a wealth of attractions and holiday options. Head north from KL up to the west coast to explore historic cities, sun drenched beaches, cool mountain retreats and to experience the local lifestyle. The North South Expressway makes travel around the peninsula easy and fast. Adventurous travelers can explore the far north and head through scenic mountains terrain to the rustic east coast. Interesting sights here include quaint fishing villages,cultural pastimes and numerous islands off the coast. South of KL,the states of Malacca, Negeri sembilan and Johor beckon with a wealth of historical and cultural attractions.The best part about West Malaysia every state will be represent with difference spectacular culture and lifestyle. That will be an a awesome trips if you could visit and get to know all about west Malaysia with difference ethnic and rich with warmest and friendly smile. What are you waiting for? Come and plan your next holiday to Malaysia ” Truly Asia “.